The reduction of the FHA mortgage insurance premium was announced for most FHA loans closed on or after January 27, 2017. The incoming Trump Administration suspended the change with its first executive action. FHA Homeowners Can Still Save an Average of $900 Annually From the 2015 Reduction. Further Estimated Reduction of $500 Suspended. On January 9, 2017, the Federal Housing Administration operating under the Obama administration announced a further reduction in the FHA loan annual mortgage insurance premiums (MIP) for new loans. The change would affect most Title II FHA mortgage loans with a closing/disbursement date on or after January 27, 2017. Excluded were loans made for properties in the Hawaiian Homelands. These new MIP rates would have reduced the annual premiums by a quarter of one percentage point, bringing them in line with what rates were prior to pre-housing crisis levels of 2008. This is referred to by many as the "collapse of the housing market." Homebuyers financing their homes with an FHA government-backed loan could have saved an additional $500 per year based on an average $200,000 mortgage with a term of at least 11 years. Less than two weeks later in the first hour of Trump's presidency, the incoming administration suspended the rate reduction with its first executive action. The suspension of the 0.25 percentage point premium rate cut happened before the reduction had even taken effect. Since FHA loans have a minimum down payment rate set as low as 3.5 percent, it is compulsory that borrowers pay the MIP. When someone purchases a home with an FHA mortgage, part of their mortgage payment includes a required annual mortgage insurance premium (MIP). 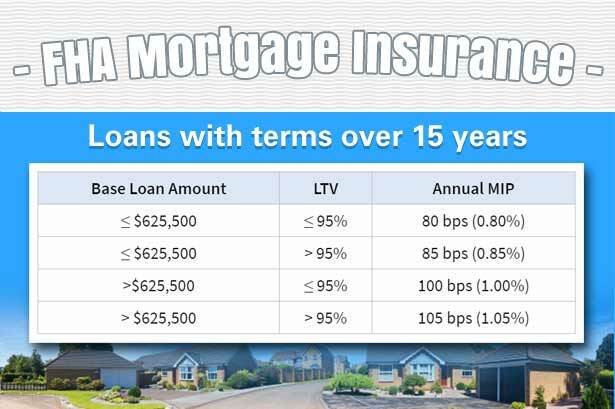 The amount of the annual MIP is based on the loan-to-value ratio, base loan amount, and the term of the mortgage. Loans backed by FHA are popular because the FICO score requirement of 580 is lower than what is required for conventional mortgages and the down payment can be as low as 3.5%. Buyers must still demonstrate their ability to qualify for a mortgage and pay it back on time. April 9, 2019 - Not all income is allowed to be used for the purposes of qualifying for your mortgage loan. For example, people who have a side income selling items online on Etsy or eBay may have a hard time convincing the lender to use that as part of your qualifying income. April 7, 2019 - Buying a home for the first time? Need some advice on how FHA home loans work? Here are some common questions about purchasing a home with an FHA mortgage you should know the answers to before getting started. Is a Builder's Permit Needed for a One-Time Close Construction Loan? April 6, 2019 - One of the main issues with construction loans with two closing dates is that there is no guarantee that the borrower will qualify for the second loan. Borrowers who do not use FHA One-Time Close loans must be careful with credit and related financial issues. April 1, 2019 - First-time home buyers are often concerned about the amount of their down payment requirement with a new home loan. That is one reason why FHA mortgages are so attractive to qualified borrowers - the 3.5% down payment requirement is an excellent alternative to other mortgages.